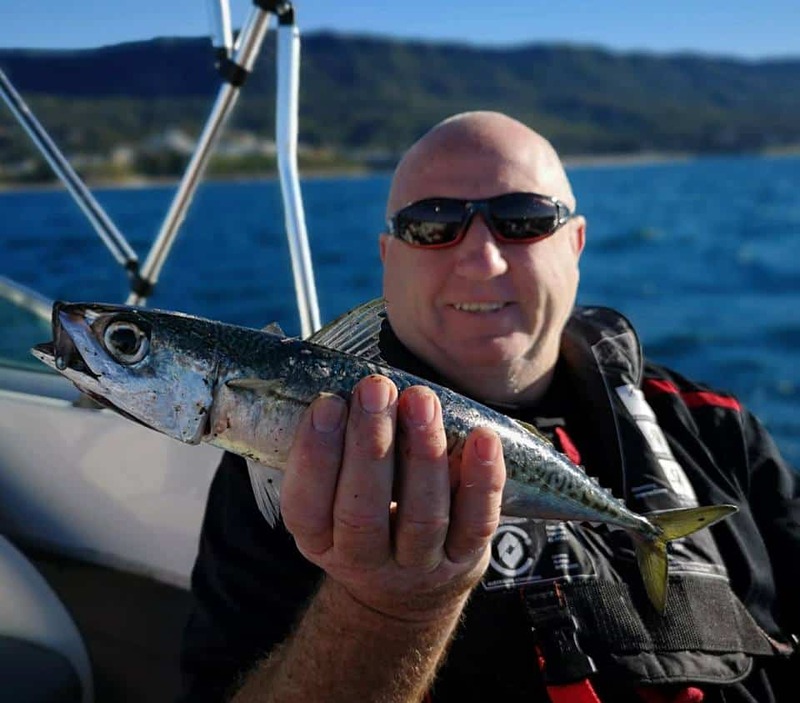 After a week of champing at the bit, waiting to get out fishing in Australia between family engagements, I finally managed to get my feet wet with a boat trip with my brother-in-law, who fortuitously owns his own boat! 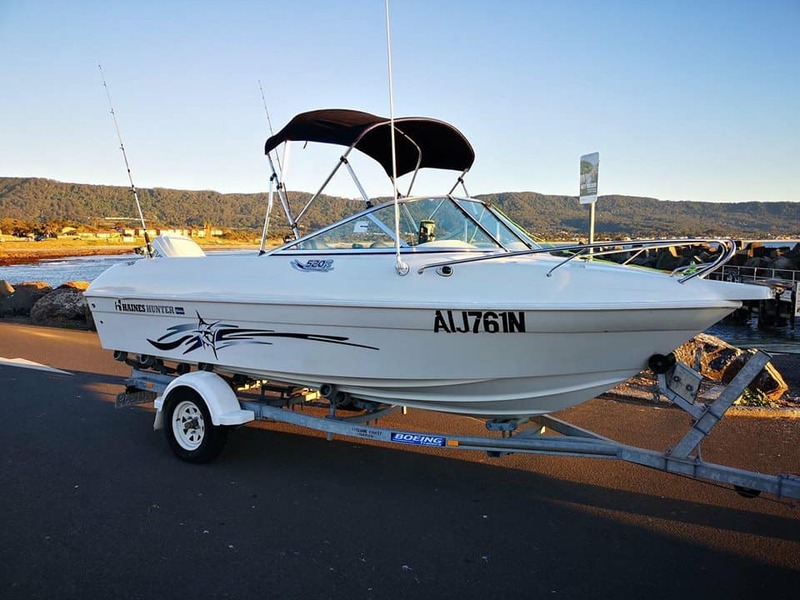 It’s a cracker of a vessel too, well equipped, with a powerful 115hp Evinrude motor which propels the hull nicely at over 35 knots, which meant that we got to our intended spot quickly and safely, dropped anchor, and prepared to fish… but what would we catch? In truth, neither Mick nor I had much idea what might lurk beneath us (except Great White Sharks obviously) and we went with light tackle intending to have some fun. I took a Sonik Sports Magna 4 piece travel rod, designed to be used with small lures, and Mick tackled up with slightly heavier gear, just in case! My AVX reel was loaded with 30b braid, a 10lb fluorocarbon leader added, and I flung lures for a while whilst my compatriot offered slivers of fish and shrimp hook baits to see what happened. 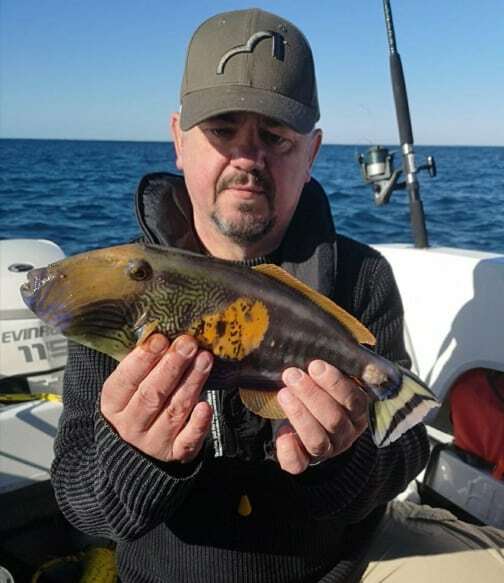 In my ignorance, I’d selected lures which I just couldn’t fish effectively in over 40 feet of water, and as Mick had detected bites on ‘proper’ bait, I opted to switch tactics. Although designed primarily as a lure rod, needs must, and I swapped the lure for a simple paternoster rig, slipped on a sinker, and baited the hook with a shrimp. It was easy to drop over the side of the boat, control the braid with my thumb as the lead descended, then carefully feel for any piscine attention. I didn’t have to wait long before I felt something nibbling at the other end, and as the rod tip bounced downwards, I struck into a tiddler which was quickly hoisted aboard. Even though we were both unsure about what we might catch, I’d done enough reading prior to travelling, and easily recognised the intruder as a small reef fish similar in body shape to the black bream found in UK waters, but much more brightly attired in a coat of bold stripes, yellows, and blues which shone beautifully in the early morning sun. I’d caught my first Australian fish! Mick then caught a Spanish Mackerel, bigger than my bream, but equally feisty, providing great sport as it fought from the depths. I could feel huge fronds of kelp wafting across the braid, and as the tip flexed, I quickly settled into a rhythm of spotting the long, slow pulls of kelp, and the much faster yank of an actual bite; great fun! I caught a Tailor fish, so did Mick, and we matched each other fish for fish as the morning progressed. On leaving the harbour, we’d already spotted dolphins cavorting across the surface of the ocean, but the next thing I witnessed was a much bigger surprise. My hearing isn’t too good, but I distinctly heard a whooshing noise behind us, and Mick pointed out a huge swirl around 30 yards from the boat as something slipped away; “whale” he exclaimed! I couldn’t believe this, I’m around a mile out at sea, in Australia, we’re catching fish, the sun was shining, and now we had a humpback whale for company! Brilliant! It was indeed a humpback, on her way to breeding grounds further north, and she offered one more glimpse of her huge back, shining black and barnacle clad, as she slowly moved away from us. I have to say that as fishing trips go, this was getting better and better! Both Mick and I continued catching a myriad of (mostly unidentified) species, all of which were safely returned, before I felt a surprising wrench on the rod tip which saw the rod hoop right over as a fish felt the hook. This one stayed deep, straining against my rod as it fought to reach the safety of the kelp below. 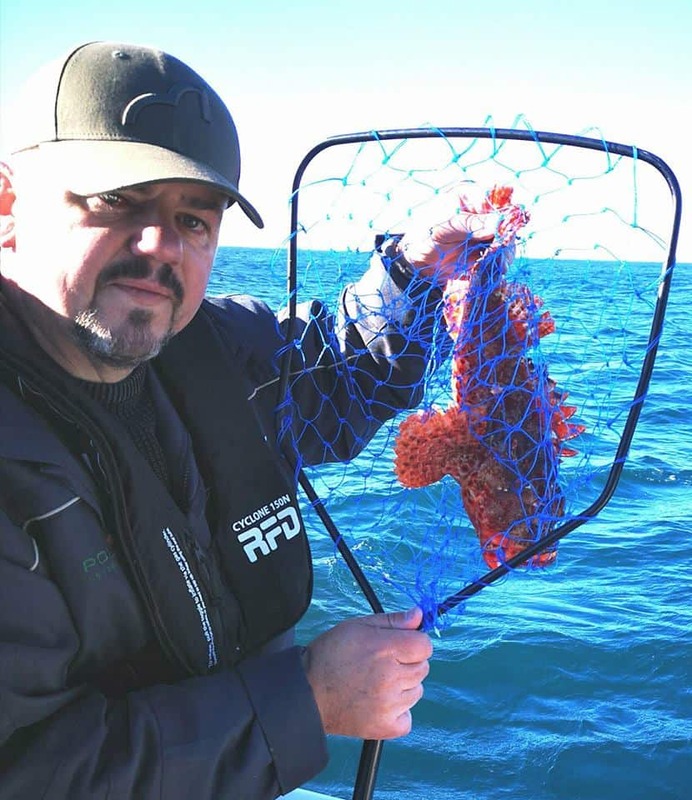 I held the pressure, and as I pumped the fish upwards, saw a flash of brilliant red as the first of a trio of Eastern Red Scorpion fish broke the surface. Clad in fearsome red armour, and protected with an array of venomous spines, we both knew this was a fish not to be trifled with, so it was netted, rested on the mat, and the hook removed with long nosed pliers before it was hoisted aloft still in the net for a picture, then lowered back into the sea; another species to add to the tally. The action slowed, so we decided to move, and jetted off to find another spot. We noted that most boats had moved further away but opted to give the new mark an hour to see what would happen. Nothing did. 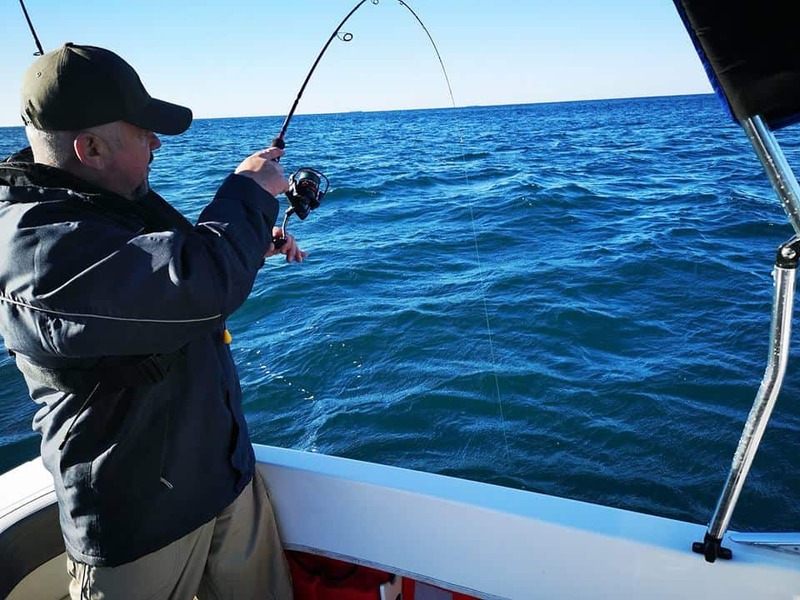 We enjoyed the sun and the gentle ocean, but couldn’t get a bite, and soon moved again to a third mark, dropped the anchor, and spooled the lines into the depths. For the next 15 minutes, things were quiet, but then a series of brightly coloured wrasse were boated, Morwongs followed, juvenile snappers were caught, more tailors, more mackerel, and more fish we couldn’t identify all came to the surface in a steady stream of bites which saw us both having fun. As an added bonus, we also enjoyed a few minutes watching a huge seal playfully tossing some flotsam on the surface of the waves in the sun. We probably caught around 80 odd fish between us before deciding to head back and trailer the boat, so enjoyed a fast ride back to the harbour as the sun started to set.